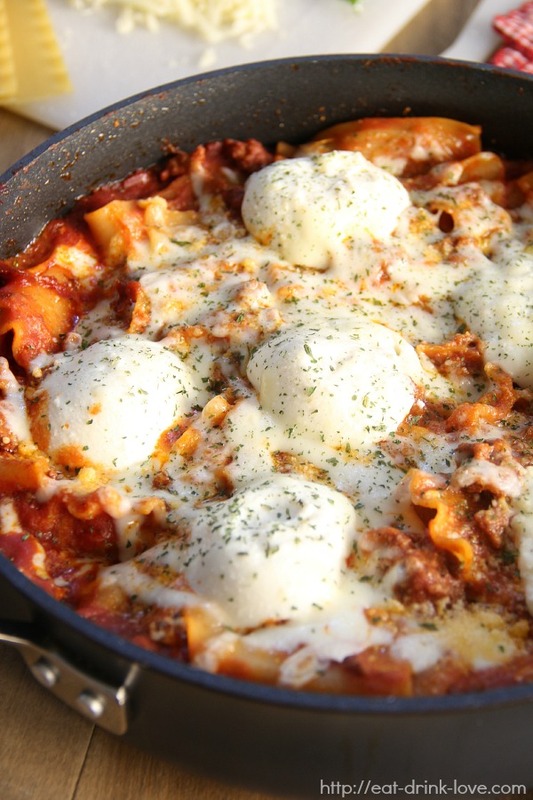 Skillet Lasagna - Eat. Drink. Love. 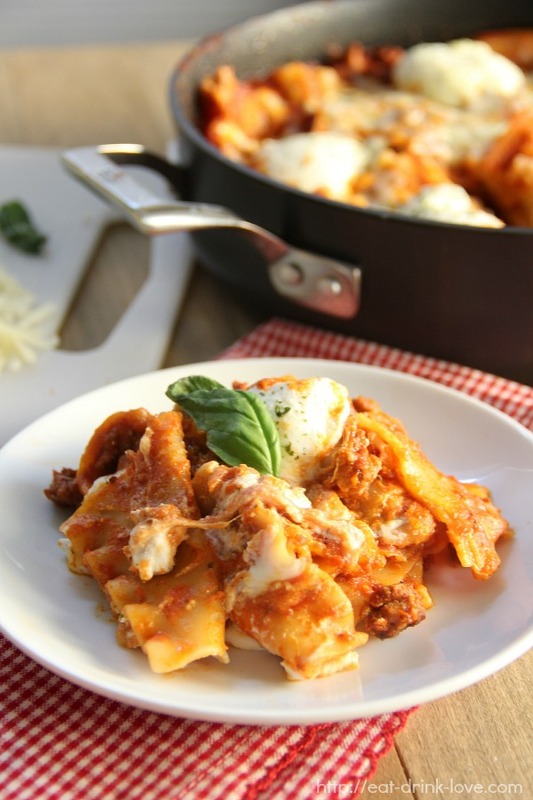 Lasagna is one of those special dishes in our house. I typically make it for a nice Sunday dinner or for a holiday. 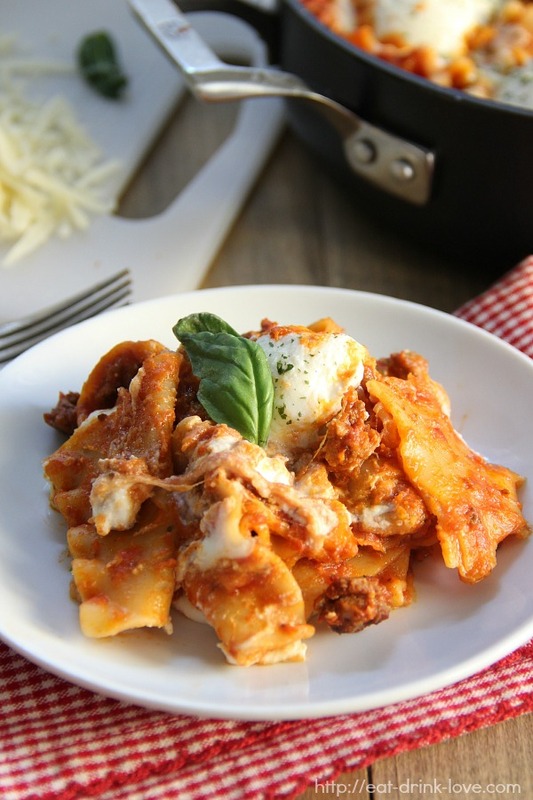 While I love how filling and comforting it is, it can take some time to prepare between cooking the meat, boiling the noodles, mixing up the cheese mixture, and then baking the lasagna for a good 40 minutes. I always end up with a huge mess in my kitchen. Enter Skillet Lasagna. One pan. That’s it. No bowls, no other pots or pans required here. You’re welcome. This was the easiest lasagna I’ve ever made. It was all done in about 40 minutes and I wasn’t left with a bunch of dirty pots and pans and bowls. Clean up was a breeze! 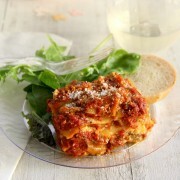 My husband agreed it was just as good as my “regular” lasagna and got seconds and thirds. You know you have always won when your spouse goes back for seconds! I’m not sure I’ll ever make “regular” lasagna again! 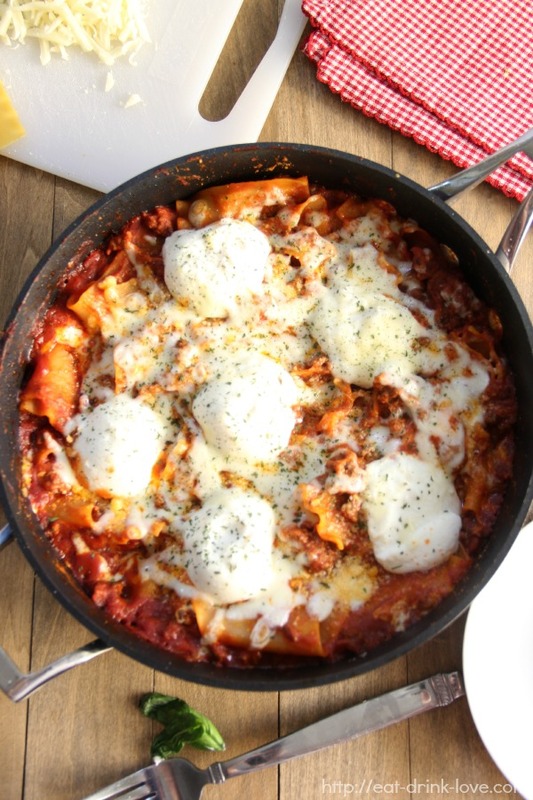 Now if you are OCD and love nice, clean lasagna slices then this dish might not be for you, but if you’re down for a lasagna that’s quick and made in one pan, then this is the lasagna for you! Heat the olive oil in a deep skillet over medium heat. Add the onion and cook until translucent, about 3-4 minutes. Add the ground beef and the salt, pepper, garlic powder, and the oregano. Use a spatula to break the beef up into small bite-size pieces as it cooks. Cook until brown, about 8 minutes. 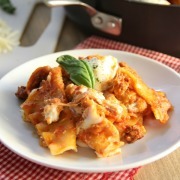 Add the broken up lasagna noodles. Pour the sauce over the noodles and beef and stir. 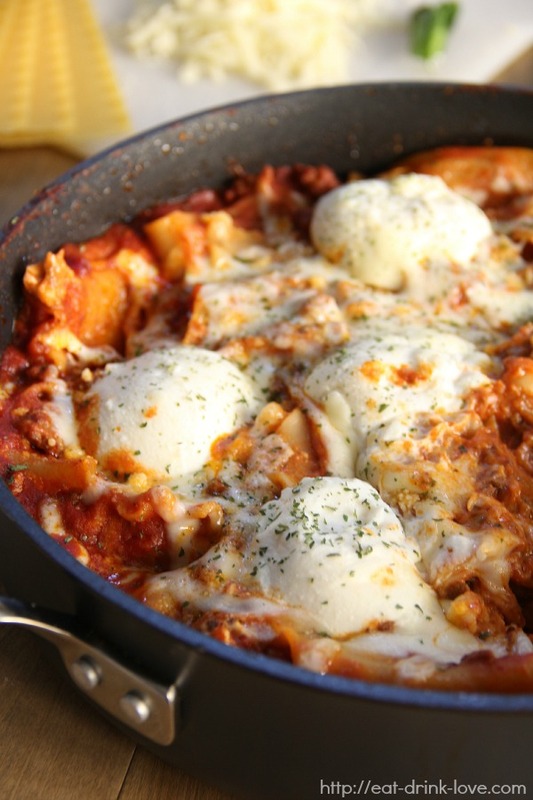 Cover the pan and let simmer until the lasagna noodles are tender, about 15-20 minutes. Stir in 3/4 cup of the mozzarella, 1/4 cup of the Parmesan, and 1/4 cup of the ricotta. Then spoon the remaining ricotta in dollops over the top of the lasagna followed by the remaining mozzarella and Parmesan. Place the lid back on the pan to allow the cheese to melt or stick the pan under the broiler until the cheese is bubbly and melted. Serve. I haven’t made this in such a long time and I don’t know why. You are 100% right how easy and delicious it ends up. Your looks amazing. I am sucker for big blobs of mozzarella. 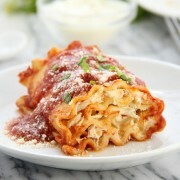 Gosh, why would I nitpick when this looks just as good (or even better) than the traditional lasagne? If it tastes just as great less the hassle, I’m betting on this one!!! Can’t remember the last time I made lasagna. Thanks for reminding me all the deliciousness I have been missing out on – I have to make this skillet recipe soon! 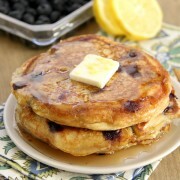 Pingback: 24 Perfect Back-to-School Recipes - Eat. Drink. Love.